Two nations, a coalition of NGOs, and the transforming power of water bring life back to the Sonoran Desert. To the untrained eye, the Colorado River just south of the U.S. border, where water used to run all the way to the Gulf of California, looks today like it has for much of the past 17 years—mostly dry. But for experts, and for the local community, there is new hope for this barren stretch. In March 2014, a consortium of scientists working under a U.S.- Mexico agreement called Minute 319 began monitoring the release of 105,392 acre-feet of water into the arid southern stretch of the Colorado River from the Morelos Dam, which sits on the two countries’ border. More than 18 months later, the event, known as the Pulse Flow, has delivered in many ways. It proved just how well the U.S. and Mexican governments could collaborate on sensitive water issues, supplied valuable data, and provided meaningful ecologic and recreational benefits, as well as social benefits for those involved. In and of itself Minute 319, which was signed in 2012, is a landmark achievement for the two governments. Since agreeing to their first detailed Colorado River usage accord in a 1944 treaty, the adjacent nations have primarily focused on human water use and ownership issues. So this effort to consider the environment is a significant departure from the majority of past management efforts. No doubt, the Pulse Flow has given scientists a much better understanding of the environmental hurdles currently facing the lower part of the Colorado River. In particular, they were surprised by how quickly the discharged water soaked into the ground. In this vulnerable ecosystem, water must continue to flow in order for indigenous cottonwood and willow trees to germinate. In turn, that vegetation helps lure wildlife back to the area. But 90 percent of the Pulse Flow’s water seeped into the earth within the first 40 miles of its release from the dam, according to Karl Flessa, co-chief scientist of the Minute 319 monitoring project and a professor of geoscience at the University of Arizona. One problem was that non-native scrub vegetation called salt cedar had grown in so many places in the dry riverbed, preventing a smooth flow. In locations where workers were able to clear brush and do some land contouring before the Pulse Flow, the transformation was notable. 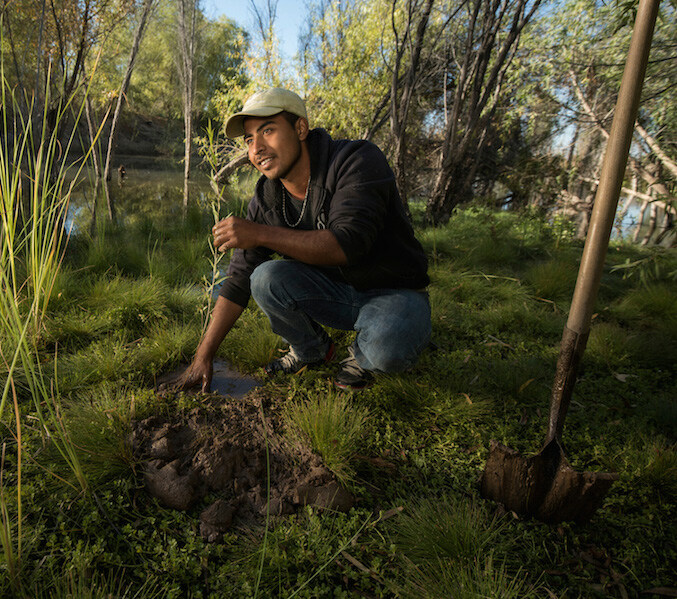 At the 1,200-acre Laguna Grande Restoration Area, located about 50 miles south of the Morelos Dam, there is still running water and more than 100 acres of developing cottonwood and willow forests. There were two key reasons for this success. First, the nonprofit Sonoran Institute spearheaded a year-long project to clear and prepare the area for native plant restoration before the Pulse Flow occurred. This allowed the water, when it arrived, to more effectively nurture the germination of the willows and cottonwoods. Second, a base flow, which is a Minute 319-created set-aside of 52,695 acre-feet of water, can be used as needed at Laguna Grande and elsewhere on the Mexican portion of the river through December 31, 2017. This water, which is sourced from Mexico’s irrigation system as well as the Morelos Dam, provides conservationists with a vital tool to continue surgically aiding parts of Laguna Grande that need additional hydration. Beyond Laguna Grande’s big hit, the emotional and community-building value of this endeavor runs deep. When the project began, no one was sure how far the water would run from the dam. In fact, those involved bet on whether the flow would make it the length of the lower basin all the way to the Gulf of California. Flessa, who has worked on the Colorado River delta since 1992, wagered that it wouldn’t extend that far. Flessa and his colleagues were not the only ones captivated by the flow. Days before the water was released, residents of the town of San Luis Rio Colorado, located 25 miles south the Morelos Dam, cleaned litter from the dry riverbed and held picnics by its banks. When the water arrived, the excitement was palpable. Film footage of the flow depicts families delighting at the water’s return. Now the question is whether those working on this project will be able to build on their efforts. Minute 319 is a detailed pact. Beyond allowing for the one-time Pulse Flow and the additional base flow to infuse water into the river’s lower reaches, it also provides for Mexico to store some of the water it’s entitled to under previous agreements in upstream U.S. facilities. The agreement will expire at the end of 2017. Based on what’s been learned, Flessa and Zamora Arroyo and their colleagues are confident that with additional scouring and tweaks in the water-release design an even longer-lasting legacy can be realized.